Virgil Flowers, ace investigator in the Minnesota BCA is working on a recycled wood scam when the future of religious history, and the state of Israel intervenes. A stone with hieroglyphs and Hebrew characters has been found, threatened to turn Jewish history on its head, then been stolen. Flowers is called in to retrieve the stone from the dying university professor who stole it. He must prevail over media-hungry 'experts', killer Turks, the Mossad, a man with nothing to lose, and the well-endowed Ma Nobles. John Sandford brings wry humour and a sharp insight into human behaviour to his Minnesota-based thrillers. In Storm Front we also get a glimpse of life in Israel as the story takes us to archeological digs and famed locations. Sandford's BCA characters are the best that the thriller/suspense genre can be. They can be harsh, like Davenport, or hugely compassionate like Virgil. They have skills, tenacity, other interests, relationships complex and simple, and an eye on the politics and human sides of criminal apprehension. 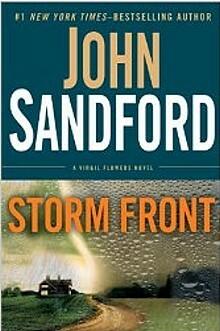 In Storm Front, Virgil demonstrates his usual brand of unusual crime solving techniques, willing to bring in any asset that might help him see that the best outcome is achieved. John Sandford once again takes us on a hair-raising ride that is all the more engrossing because the people at risk are drawn in three dimensions. They have strengths and flaws, and after so many books are old friends. Although this book works on it's own, if you are a thriller reader, I recommend after reading it that you go to our Lucas Davenport page and start working your way through the interweaving stories of Virgil Flowers and his boss.